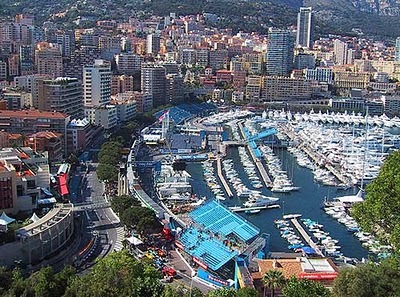 Major ethnic groups in Monaco are the French, Italians, and the Monegasque. The country's population growth rate stands at 0.4% annually. The most commonly spoken languages in the country are English, Italian and French. These linguistic affiliations are also observed in Monaco's culture and food. The French and Italians mostly influenced the life and culture of the people. With regards to food, its proximity to the sea leads to the popularity of seafood. In fact, fish is an important part of people's diet. French wines and food are also present in the country. Monaco observes the November19 as its Independence Day . The Principality of Monaco is its own country even though it has an area of just over three-quarters of a square mile. Inhabited by about 32,000 people, it is situated on the Mediterranean coast near the borders of France and Italy. The country can be reached by car from France and Italy. Another mode of transportation for reaching Monaco is by train directly from either France or Italy. Upon arriving in the city, you will notice that the streets are impeccably clean. The place evokes modern and old-world ambience. Crime is very minimal in Monaco. Most travelers and visitors go to Monaco for the casinos, the grandest place in the world. The plaza, or square, in front of the casinos is always bustling with activity. The Oceanographic Museum and its spectacular aquarium should not be missed once you are in the country. Other major events to anticipate are the Grand Prix and the changing of the guards at Palace Square on the Rock of Monaco. 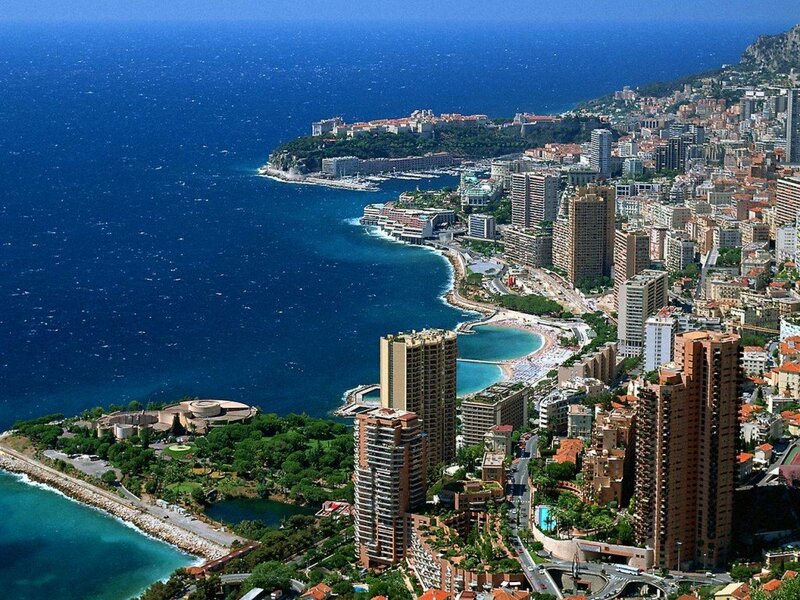 There are no actual "cities" in Monaco due to its tiny size, but the most populated quarter is Monte Carlo. The highest point in Monaco is about 206 feet. Its latitudinal and longitudinal extent is 7degrees 24' East and 43degrees 44' North. It is predominantly hilly and rugged, with mildly wet winters and hot dry summers. During autumn, Monaco's temperature borders between 70degrees F and 55degrees F. The weather has influenced the vegetation and animal life existing in the area. The country features a variety of plants and animals that are typically found in the Mediterranean. Certain species of palm, carobs and mimosas abound along with certain species of shrubs and flowers. 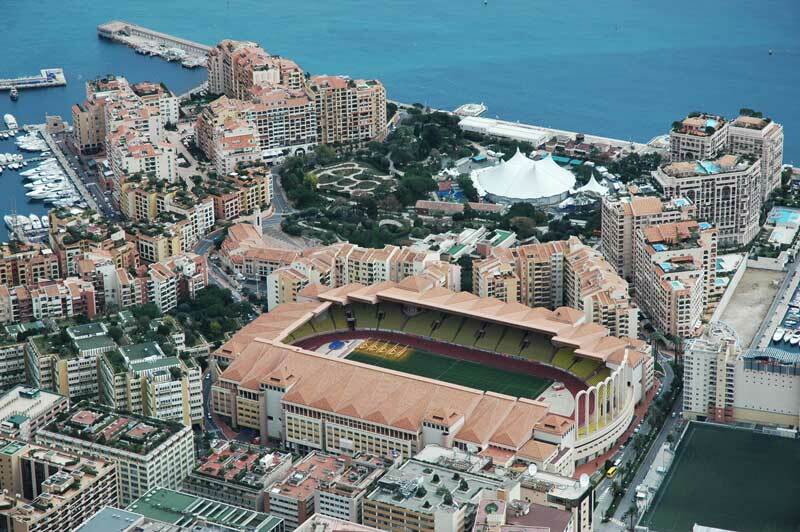 Monaco took its name from the Greek word Monoikos meaning "single house" or "set apart." Being free for 800 years, it became under Sardinia's protection in 1815 after being annexed to France in 1793. A treaty made with France stipulates that it would become an independent state of France should the Grimaldi dynasty phase out. Prince Rainier III succeeded Louis II on May 9, 1949. Rainier married actress Grace Kelly and had three children, with their only son Prince Albert Louis Pierre considered the heir to Monaco's throne. Princess Grace died in a car accident at 52 years old. When Prince Rainier III died in 2005, his son became the current ruler Prince Albert II. Its tourist business attracts as many as 1.5 million visitors annually. A dispute between France and Monaco resulted from the latter giving tax shelters to French businessmen. A compromise was reached imposing taxes on French people residing less than five years while taxing Monegasque companies operating 25% of their business in other soils. It was declared a member of the UN in May 1993. In 1997 the country celebrated its 700th anniversary. The arts and culture are highly prized in Monaco. The Monte Carlo Philharmonic Orchestra, Ballet and Opera offer a selection of world-renowned programs. Also noteworthy to see is the International Circus Festival and the Monte Carlo Magic Stars. The country also hosts events such as yacht shows, trade shows, and film and television festivals. Some significant attractions in Monaco are the Royal Palace, the official residence of the Grimaldi family - the longest-ruling monarchy in the world; the Oceanographic Museum and Aquarium that was personally opened by Prince Albert I in 1910; the Monaco Cathedral - a beautiful structure that was built in 1875 and rests on the place where a church that was dedicated to St. Nicholas once stood; the Monte Carlo Casino that was built in 1878 by Charles Garnier, the famous architect of the Paris Opera House; and the world-famous Grand Prix, considered one of the most important events in the country. There are so many things to do and places to visit at night in Monaco. There is the world-famous Monte Carlo Casino, which is a perennial attraction. The building also houses the Casino Cabaret and the Salle Garnier, the Opera House offering ballet, opera and music. 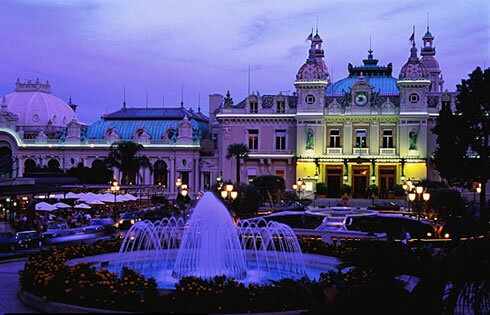 There are also gambling places in the Monte Carlo Grand Hotel and the Monte Carlo Sporting Club and the Cafe de Paris. For wining and dining, there are marvelous restaurants, cafes, bistros and bars. There are also several nightclubs, movie houses or theaters, discos and variety shows for visitors and travelers with discriminating taste. Monaco's culture espouses unity among different ethnic groups. For this, it holds festivals that have ultimately become tourist attractions. The majority of the Monegasques are Roman Catholics. The church plays a valuable role during festival celebrations. Rituals and ceremonies are held on occasions like Easter, Feast Days of Saint Roman, Saint John and Saint Blaise. Marriage is considered an integral part of its culture and is performed on the basis of traditions set by the Roman Catholic Church. Its rich culture has the support of the local and even the national government. 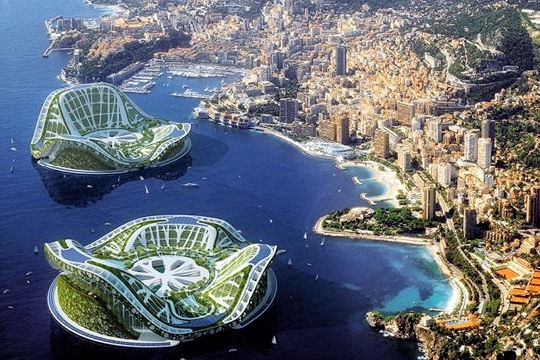 Cultural events help in the promotion of Monaco tourism to the world. French and Italian influences mark the cuisine of Monaco. Fish and most seafood are the integral part of Monegasque food choices. People are fond of taking light breakfast, and heavier lunch and dinner. Special occasions such as Christmas, Lent, and Easter dictate the specialties cooked by Monegasques. The food is traditional and absolutely delightful. Restaurants in Monaco offer a wide array of food mostly having inspirations from Italy and France. Some of these delectable specialties are Fougasse, a type of pastry that is decorated with almonds and nuts; Stocafi, cod cooked with sauce; Socca, a pancake influenced by Italian cuisine; and Barbagiuan, a special pastry that has pumpkin and rice filling. Besides the delicacies mentioned above, crunchy sugared biscuits are also widely popularized. There are special dishes that are also prepared during some religious occasions. These religious occasions could be feast days of Saint Roman, Saint John, and Saint Blaise.